This was the first cofradía, or procession we saw that week. After my rollerblade class I popped in to my Spanish teacher’s house to pick up my homework and he casually mentioned that there’s a paso going up the road in half an hour if we want to see it. I raced home and grabbed Paul who was utterly tired but put a good face on. We asked a few people then finally found them. To tell you the truth they slightly freaked me out. It was a small, simple procession, outside of the Holy Week but there were already many people watching them. The nazarenos, who are the members of the Brotherhood proceeding the paso, were wearing all black and were walking slowly and solemnly with their giant candles. ...and the others all dressed up but without the hood. According to my Spanish teacher, they are the ´serious ones´, they are not allowed to talk to anybody and usually carry a cross with them. Why do they wear the long pointy hats? The proper name of the ‘pointy hat’ is capirote. There are many theories to determine where the tradition came from. According to one it symbolises rising towards the heavens. According to another it descended from the time of the Inquisition. At this time the criminals had to wear many signs of penance, amongst others a cone shaped hat or hood. They paraded them around the town before leading them to the fire to burn them. 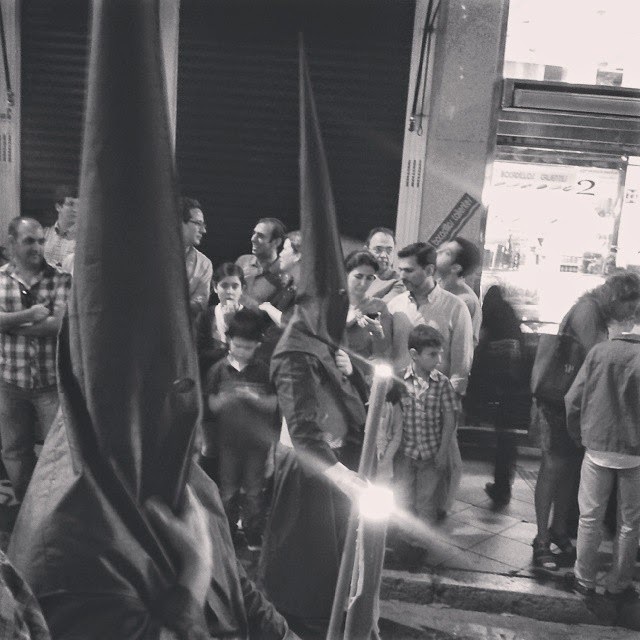 This aspect was taken over by the brotherhoods during Semana Santa in Seville. It is not, however, the only type of headwear to be seen in Spain during the Holy Week. There are many variations to it and I hope I will be able to show you a few of those, too.